We though we would share images and descriptions of a few of our latest projects with artificial plants outdoors. Once again, we are happy to report that the demand for replica plants is increasing. The availability and variety of high quality material to build artificial plants in improving every year. This summer we have designed and installed several outdoor projects. A good selection of plant material that is UV resistant in available. 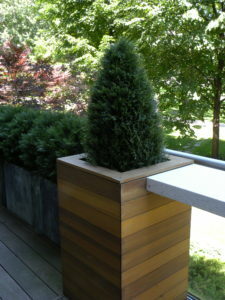 Artificial cedar and boxwood trees are one of most realistic. They are available in many sizes and forms: trees, cones, topiaries, spirals. Sizes range from 3 ft to 8ft. These plants will last for several years outdoors in most locations. Wind and sun can shorten the lifespan of the plants. We try to place them in sheltered areas whenever possible. There is a wide variety of artificial grasses available as well. These typically do not last quite as long outdoors, but again this depends on where they are placed. We typically use a variety of grasses, often incorporating a few varieties with brown, red and gold colours in with the green grass. This makes for a more realistic appearance both in the summer, and into the fall and winter. There are many benefits to using artificial plants outdoors. We have done several designs for home/condo owners who are often away throughout the summer. It is not possible for them to maintain live plants. Many condo balconies and terraces are too hot, shady or windy for live plants. The wind is a big issue. We use low plants in sturdy, weighted containers when wind is an issue. 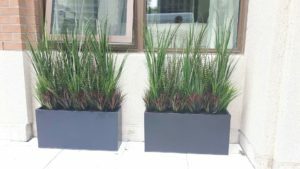 Artificial plants outdoors look great all year round. Many of our clients comment on how they enjoy seeing the greenery in the winter.